If you had a coach, a teacher, a parent, a mentor or a teammate who left their mark on you, and guided you through the challenges of growing up, this campaign will provide the opportunity to make a mark on the Farrell stadium in their honor. Once the stadium, press box, scoreboard, track and 50-yard line are named, that recognition will last until the next renovation many years from now. Coming together as a group to honor a common mentor can be a lasting example of what it means to be part of a team! Individuals / Co-Sponsors / Group or Team: Alumni who are interested in individually purchasing naming rights, or who would like to partner with other alumni to reach a naming opportunity threshold can contact John Cusick directly to discuss their options. Cumulative Donations - If you are making a donation to the Stadium Renovation Campaign on your own, you can include the name of someone who you would like to see honored. 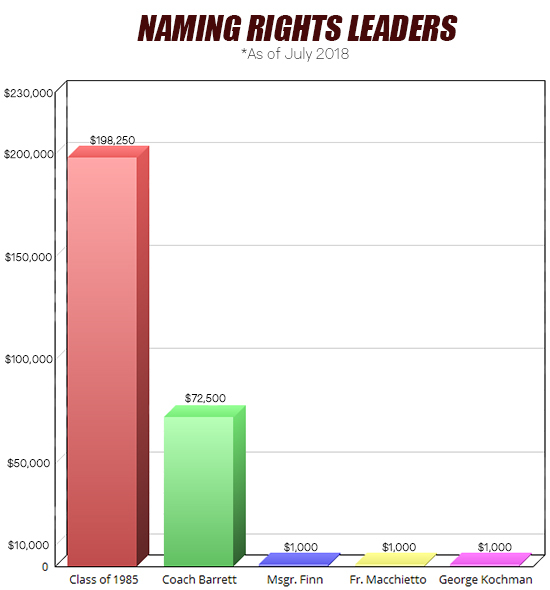 We will keep a running tally of gifts made in that person's name throughout the campaign and credit the amount raised toward one of the naming thresholds. Share your suggestions and let us know who you would like to see honored by visiting our Facebook page.